Today I have an interesting story to share. 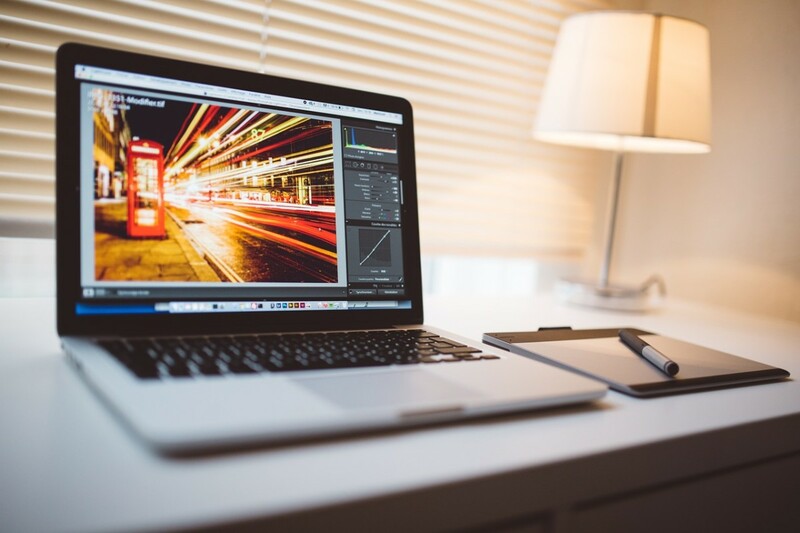 I am going to introduce you to a budget graphics tablet and hopefully help you decide if it's the right one for you. 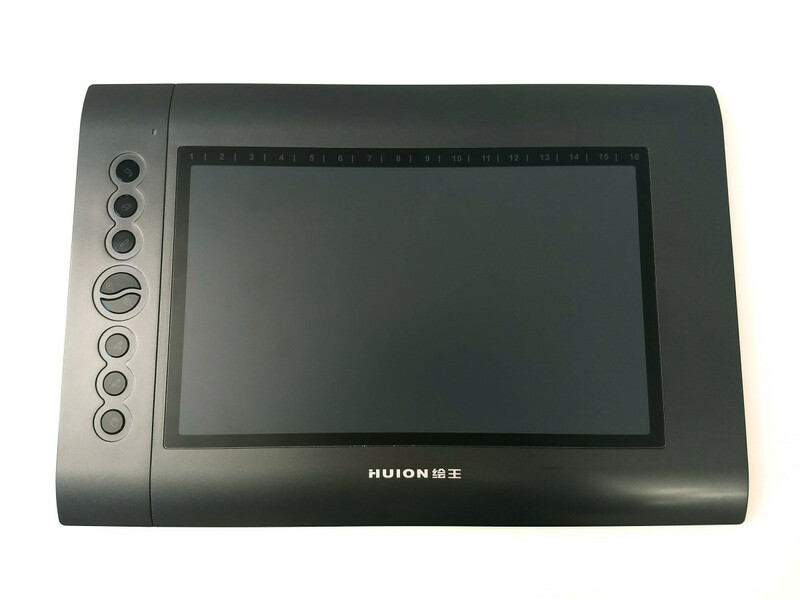 Huion is a Chinese electronics manufacturer that specializes in the making of drawing tablets and accessories. They are known for offering affordable products that give the big brands a good run for their money. But how good are they really? Don't get me wrong when I said "affordable" just now. That is not the same thing as saying "cheap." 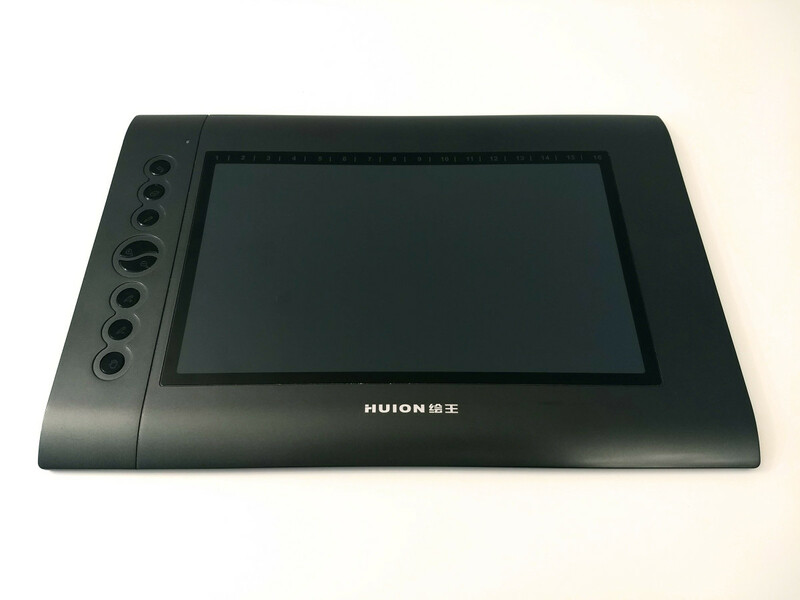 Huion make both tablets pads and monitor tablets, the latter of which can range between $500 to $900. That's not very cheap now is it? Overall, that's still a very attractive quote considering the competition. Huion's brand logo is a crown made of three pencils. You'll find out that it's a very fitting logomark when you have a few moments to look at their product catalog. 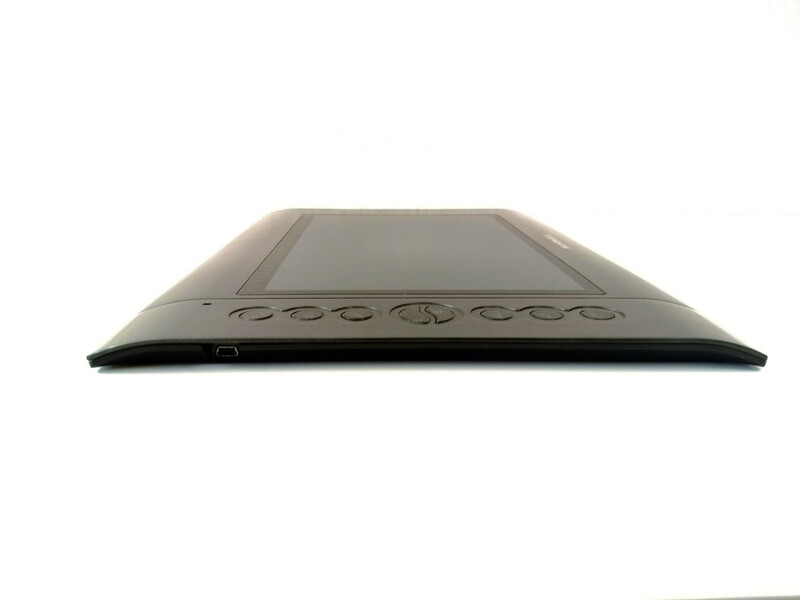 The company produces premium quality tablets for budget prices and they work just as described. How is that possible? Is it a trick? Well, no. It's a fact. 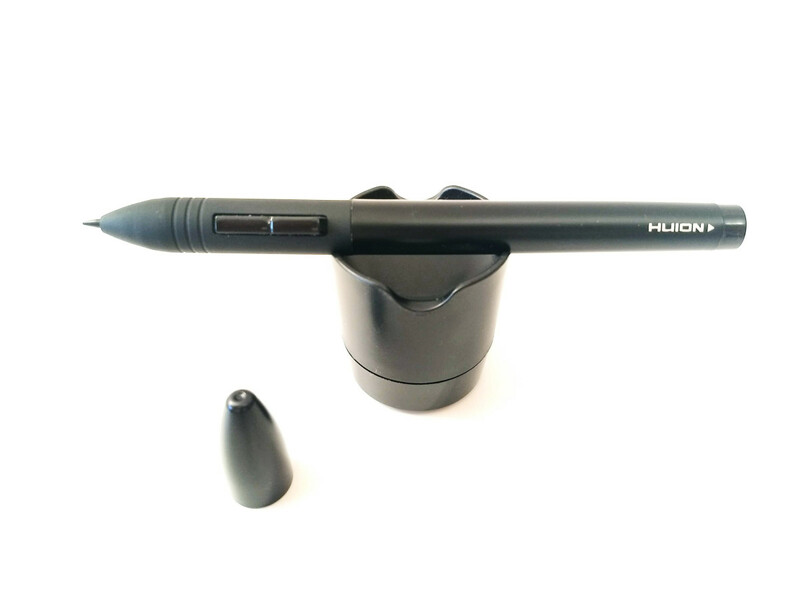 Huion's products perform just like advertised with only a few minor inconsistencies. For the most part, customers have issues with the physical aspects of the products rather than their software. But before I get into detail, let's start with my review of Huon H610 Pro! 13.90 x 9.65 x 0.59"
Huion H610 before it was officially merged with the Pro edition. I bought my Huion a couple years ago. Back then there were two versions of this tablet, one of which was marketed as the Pro edition. 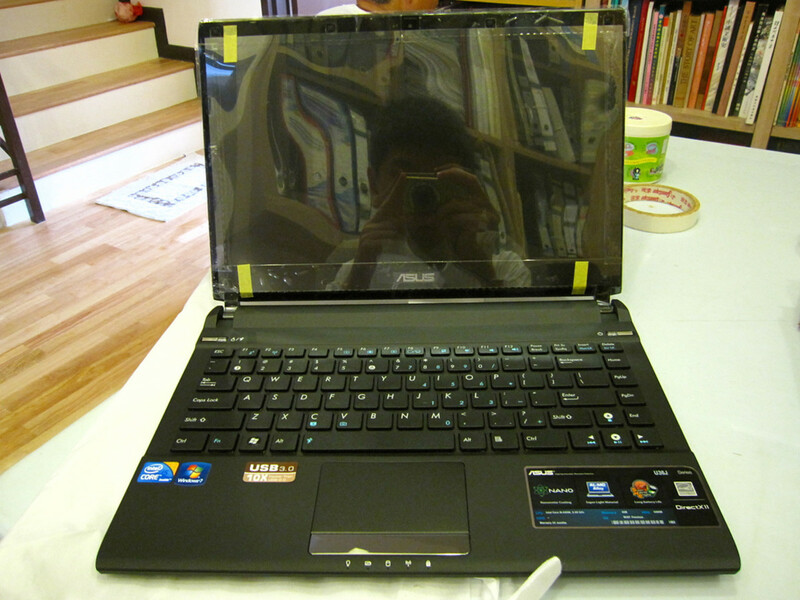 Unfortunately for me, it didn't come out until after I had purchased my "standard" H610 (see photo above). Now the company seems to have completely discarded the H610 series and renamed it officially to H610 Pro. But what is the difference between the two? Well, both tablets are exactly the same. What's different is that H610 had 2048 pressure levels, whereas the Pro edition had 8192. Also, one had a battery pen while the other came with a rechargeable pen. You can guess which is which. And that's about it! So after the company realized that those features do not justify the classification of two separate series, they eventually merged them into one. 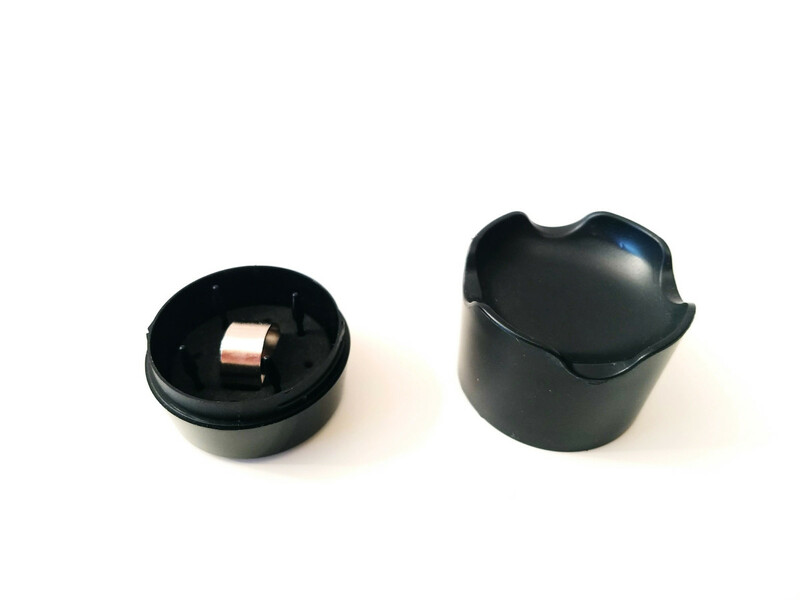 Nowadays, there is only a Pro edition and it's available in two variations - one with 2048 levels of pressure sensitivity and the other having 8192. Both of them now come with the rechargeable stylus. That's a good example of smart branding strategy that doesn't leave the customers confused. You did well, Huion! I got my tablet from an independent retailer, not the official company store. The retail price was the same but in my case, the unaffiliated seller offered better shipping quote than Huion did. That's why I got it from another source. Luckily for me, the tablet arrived very well packed in it's official box, no less. I was very surprised! My first impressions after having inspected the tablet on the outside were mixed. Let's start with the positive observations. 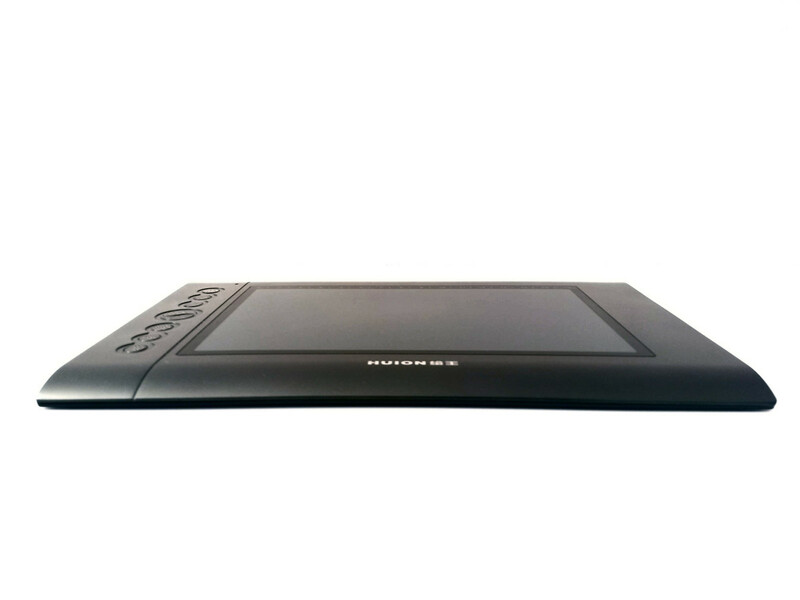 The tablet is fairly big and the spacious working area gives you enough room for drawing. That's really important, especially if you use your elbow to draw curves. On top of that, you have 24 customizable buttons in total. That's a lot of shortcuts! You have 8 button shortcuts to your left that are also labelled with their corresponding functions. However, you don't need to assign those exact functions to them. You can program them to any shortcut you want. But they're labelled already, so that would be a bit confusing. The additional 16 shortcut keys are not physical buttons. You can only activate them by using your stylus while the tablet is connected to your PC. I consider this to be an advantage as opposed to the alternative. You can also customize them to any shortcut combination you want. On the outside, the tablet looks too overcrowded with many options for your convenience. But some people are dissatisfied just for that reason alone. Depends if you're minimalist in nature or not. Among the negative observations that can be made about the H610 Pro is that it has too much to offer. That's up to personal methods of working, of course. But I also agree to an extent that all those shortcuts and keys can stand in the way more often than they are helpful. I'm not sure if having physical buttons on the tablet is a good idea mainly because I can't get used to hit the right key without looking, but I can do it on my keyboard. Also, very often they seem to get stuck in one function and you need to press a bunch of other buttons to snap out of it. Very annoying. More on that later. 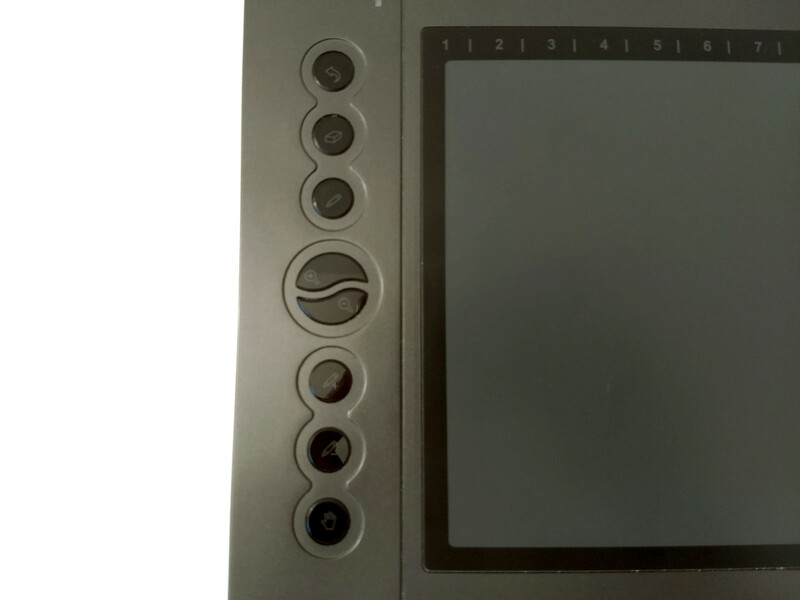 Last but not least, the tablet looks very "retro." I mean, it's not the prettiest design and it might throw some people off. Personally, I consider it to bee too chunky and I am not a big fan of the shape either. 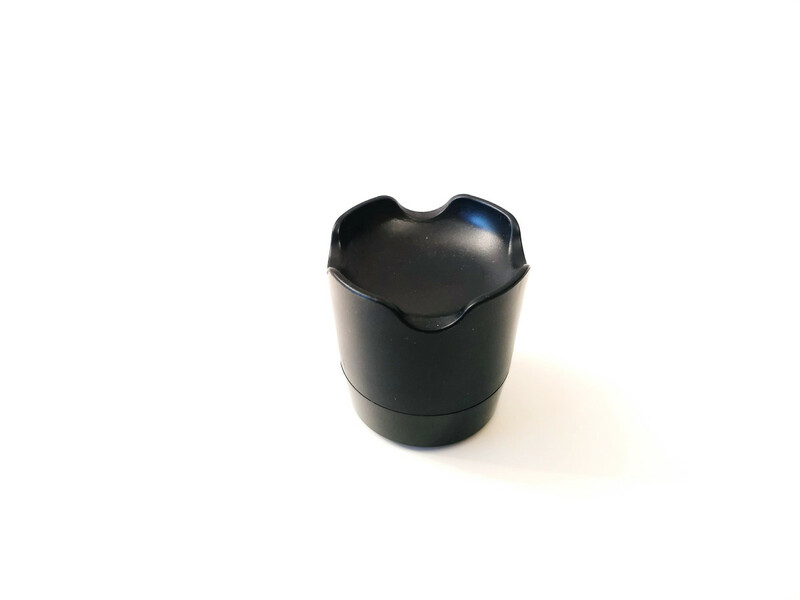 While it has rubber caps at the back to prevent slipping (really awesome), those weird curves at the top and bottom of the surface are bothering me. Maybe they are supposed to prevent discomfort when you place your wrists there. But honestly, is it really helpful? I think the tablet would look much better if they got rid of the empty space around the working area, like those curves I just mentioned. And I wish they made the entire surface flat. One major issue I have is the smell of burned electronics. That's giving me such a bad feeling of paranoia when I use it. The smell seems to come out of the pen and I'm afraid it's how it is with everybody else. I've seen other people complain about that too. The stylus smelled like a burned electronics component even before it was ever used. When you start drawing, it doesn't go away, and in fact it transfers to your fingers. At first I was convinced the fault is with my pen. Then I accidentally dropped it and it got permanently damaged. I had to buy a new one, secretly hoping that my smell problem would be fixed. Unfortunately history repeated itself. The new stylus has the same "fault." After researching about this, I found out that it's just how it is. Whether that's safe or normal, I can't say. For now I haven't experienced any fault (1+ year going on strong). So you might want to think about that before you buy! Remember when I explained the difference between the old H610 and the newer H610 Pro edition? Just to recap, one came with a battery pen while the other had a rechargeable stylus. Sadly for me, I got the bad deal on this one. But it wasn't as bad as I thought. The battery stylus was nice and felt more like an actual ink pen. It has a clickable on/off switch, which the rechargeable model doesn't. The latter one has a built-in automatic sleep mode instead. Also, the old pen didn't have a cap to protect it's nib. The rechargeable one has! 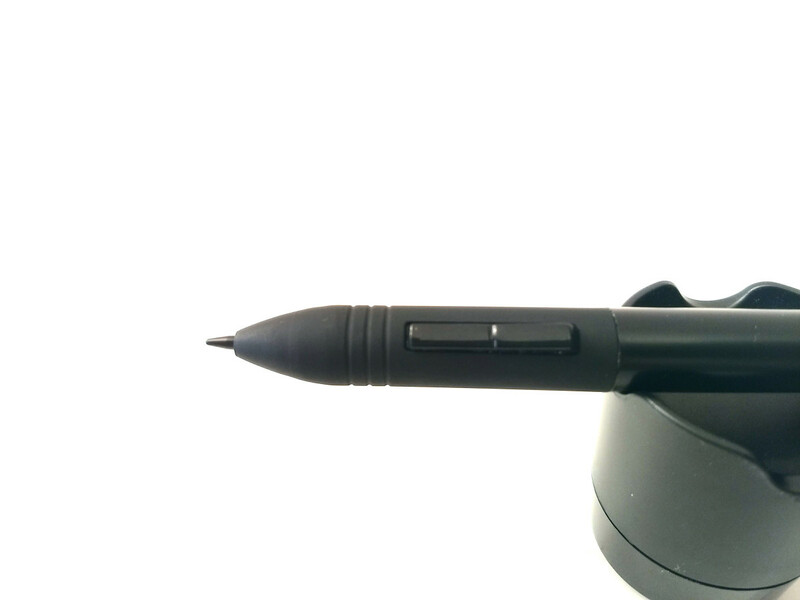 If you get an H610 Pro nowadays, Huion will ship it with the new rechargeable pen, which is twice as light. Seriously, it's so light that you feel like you're holding onto air. Working with it is a really awesome experience. No complaints there. 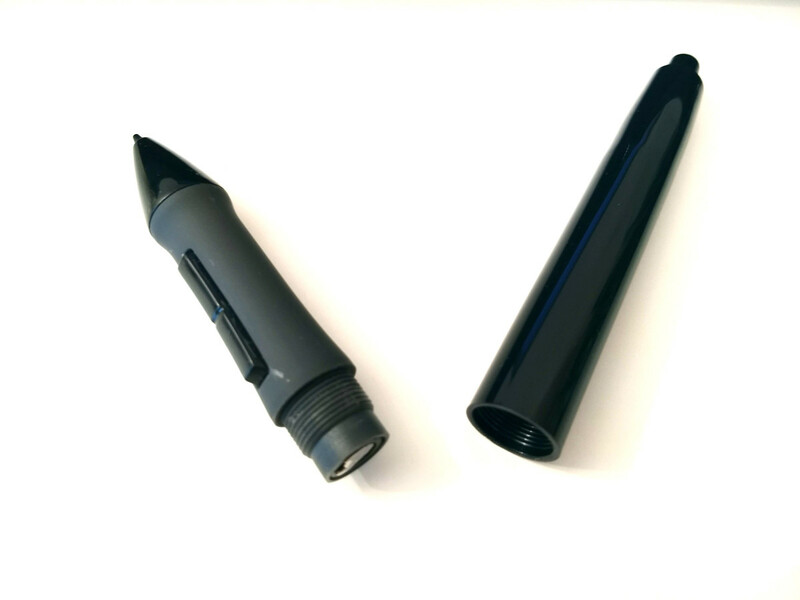 Here are a few photos of both styluses to give you an idea of what they look like. 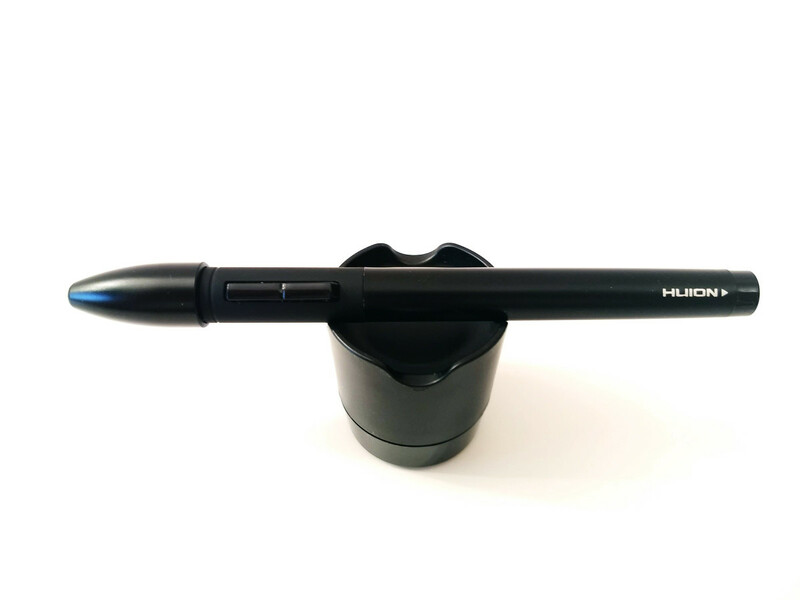 Capped battery-free stylus put on display on the pen stand. 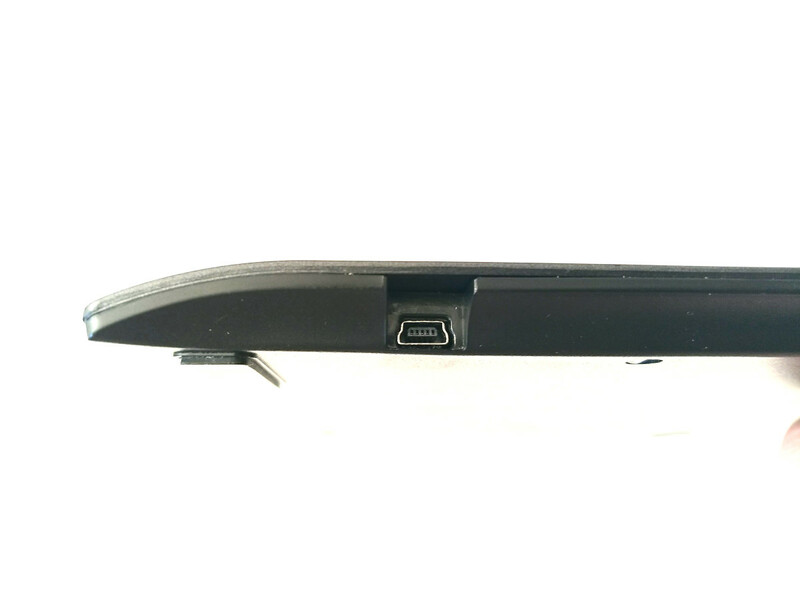 Rechargeable stylus with the cap removed. Close=up of the battery-free stylus and the textured tip for supposedly better grip. 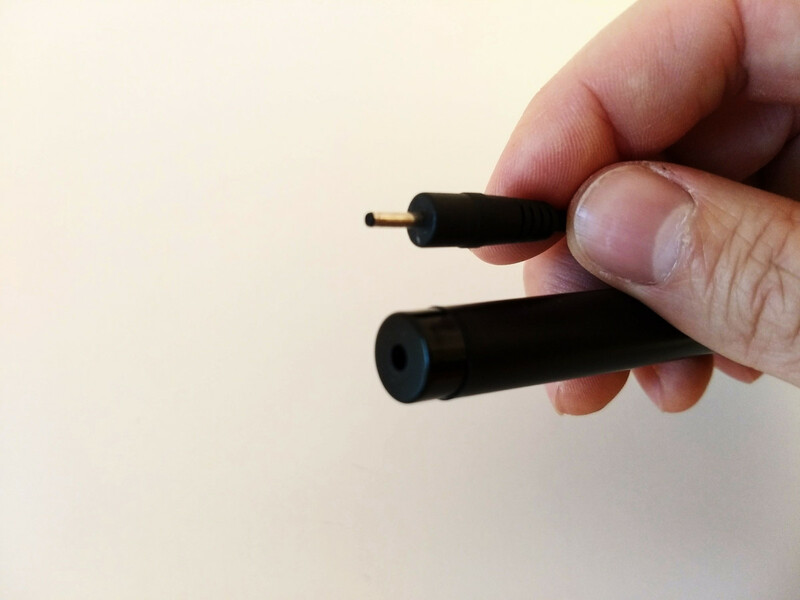 The power interface and charging cable of the battery-free stylus. Opened battery-powered stylus. That's how you change the battery. As I mentioned earlier, the smell of electronics is very unpleasant. It doesn't seem to go away even after one year of use. It's good that Huion are offering spare nibs, but in all of my experience, I've never needed any of them. No matter how careless and abusive of your stylus you are, it's more likely that you damage the drawing surface rather than the nibs. Actually, I would recommend you buy a film protector for the surface which will not only keep it scratch-free, but should also give it a paper-like texture. That would cost you about $5. Speaking of drawing surfaces, let's examine the working area. 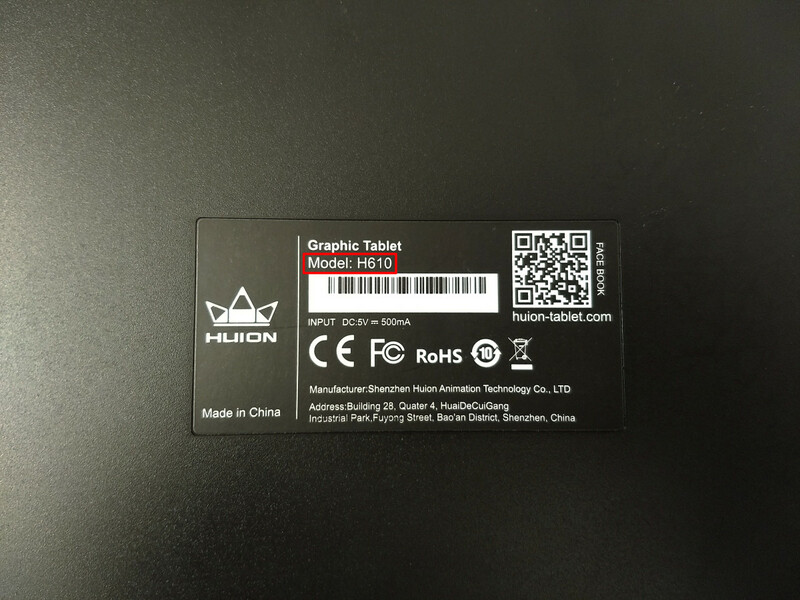 Huion sports a 10 x 6.5" touch-sensitive canvas with "Electromagnetic Digitizer," whatever this means. All these fancy words set aside, the surface looks very smooth but also prone to scratches. Initially I was worried that the nibs will leave horrible scratch marks and then I would need to replace my tablet. It is not like that at all. It may look delicate, but the surface of the working area is pretty scratch-resistant, believe me. I've unintentionally put it through hell over the course of a year. It's seen more action than Bruce Willis in Die Hard! Let me give you an example. Among the unfortunate accidents my tablet has experienced are beverage spills (mostly coffee), a few knocks on corners of my desk, scratches caused by the stylus and other metal objects like the springs of notebooks, just to name a few. There are some slightly visible scratches as a result of my poor treatment, but they don't affect the tablet's performance in any way. 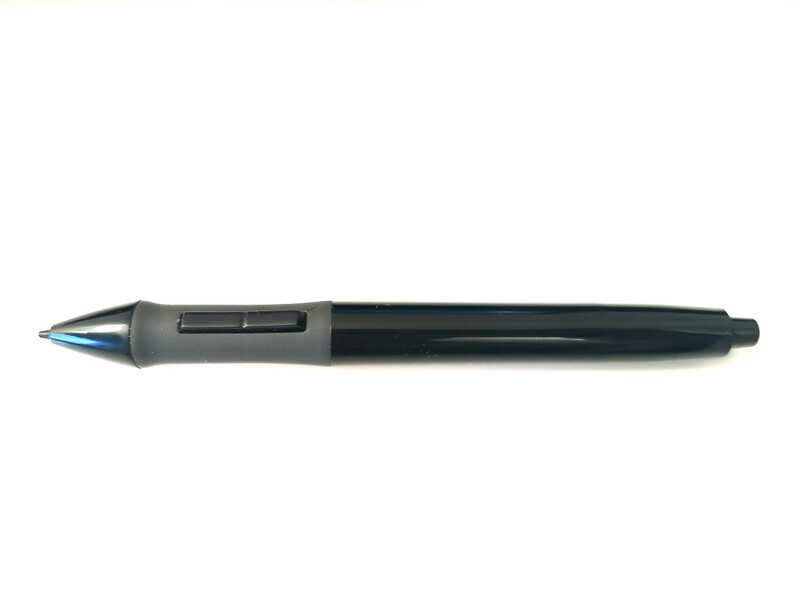 The stylus is able to run smoothly across the surface and perform like the first day I opened it. You won't feel any paper-like sensation while drawing but that can also be remedied as I mentioned earlier. Most contemporary Huion tablets have a special finish that mimics the touch and feel of paper for more realistic experience. However, my old dinosaur is not part of that exclusive club. At the end of the day, the most advantageous feature of the surface is its size. Huion H610 Pro is a standard-sized tablet that competes with such giants like Wacom. It offers you plenty of room for drawing. Just for your reference, the tablet itself is about the dimensions of an average laptop, not counting the thickness. Huion H610 Pro is a very comfortable tablet to use no matter how big it is. As previously mentioned, it offers quite a big variety of shortcut settings. 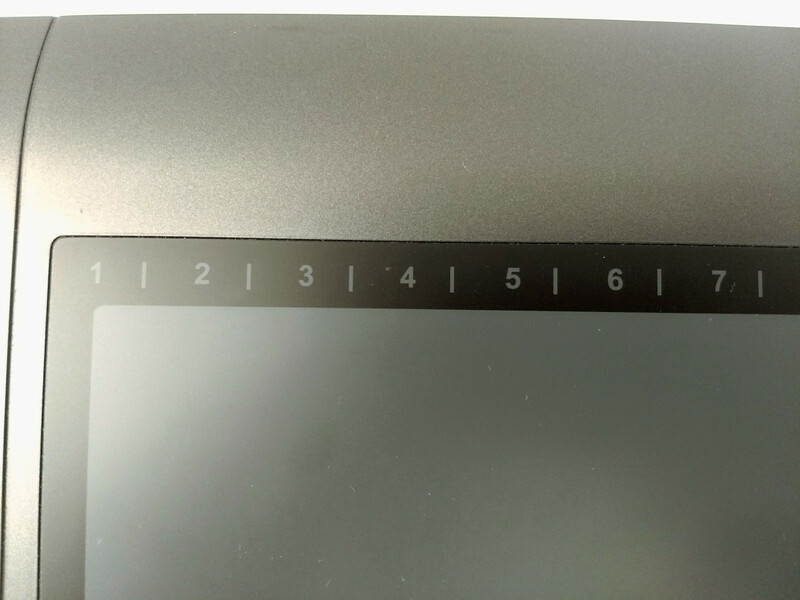 On the left side, you will find 8 physical shortcut buttons that are predefined for their corresponding functions. For example, there are buttons for brush size, zooming, action reverse (Undo) and so on. Technically you could assign entirely different functions to all of them, but that would only confuse you since the button labels are permanent. But if eight shortcuts are not enough for you, Huion H610 Pro comes with 16 more. Yep, that's twice as much! They're laid out at the top edge of the working area and resemble a ruler. Unlike the eight physical keys, these ones are touch-sensitive. This means that they only work when you use your stylus to activate them. Whether or not that's a smart idea is up to personal preference. Now let's discuss how productive all of those access points are. The eight shortcut buttons tend to get stuck on one function and won't snap out of it easily. Sometimes they get buggy and activate another function entirely. For example, this happens most often when I use the Undo shortcut. Something happens along the way and the Move tool gets called instead (on Photoshop). It then gets stuck in this state until you manage to snap out of it. This annoying problem happens with a few other buttons too. The additional 16 function keys are not exempt of issues either. They work... sometimes. Here we have a different type of problem. It's not exactly clear where the user should touch the surface with their stylus to activate one of those functions. The key number is supposed to be a safe area to target but that's not true in real testing. You will have different rates of success activating those keys depending on your drawing software, I guess. I've tested so many of them with mixed results.On Illustrator and Photoshop, keys ranging 1-4 are pretty much unusable. What happens instead is, the cursor selects the File and Edit menus since they're right up there where your stylus is located on the working area. Seems like a mapping issue (more about that later on). So for me, using those buttons has not been so enjoyable. Not to mention the fact that they're too small and there's no way to tell which one you click until you look down. If I have to make the effort to look down - and potentially turn on some light if I'm working in the dark - then I might as well just use the keyboard on my laptop. The physical keys to the left hand side are not very usable either. They're easier to remember and control. But that annoying issue that gets them stuck in one state is really defeating the purpose of them being there in the first place. Overall, the idea of having that kind of ease of access is not bad. It's just a poorly executed one if you ask me. Nonetheless, they're there. The tablet is worth its price with or without those extra buttons. If you're like me, just ignore them. Close-up of the 8 express shortcut buttons. Overview of the 16 touch-sensitive function keys. Close-up of the touch-sensitive function keys. 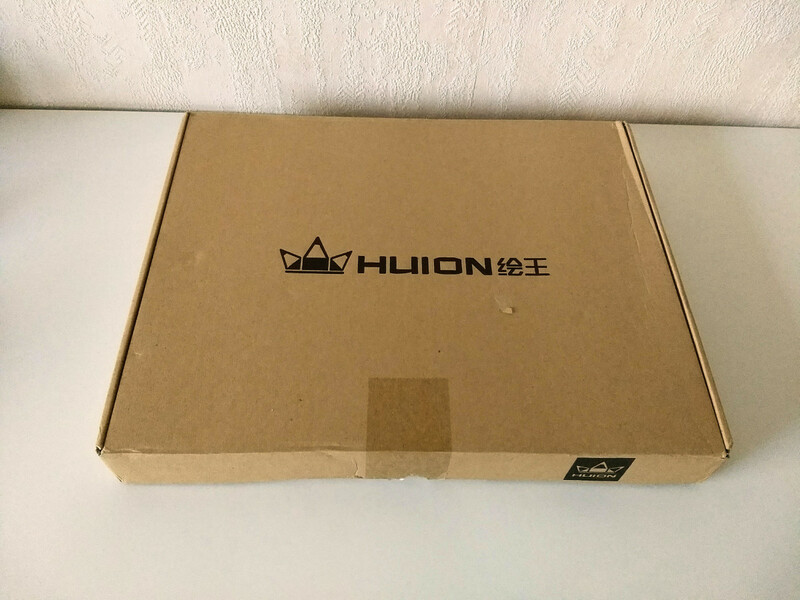 Huion ships all their products with driver CD's. And if your hardware is missing a CD ROM, you can download the drivers from the official product page. You can even download the user manual in PDF. This proves that product support is really on point! 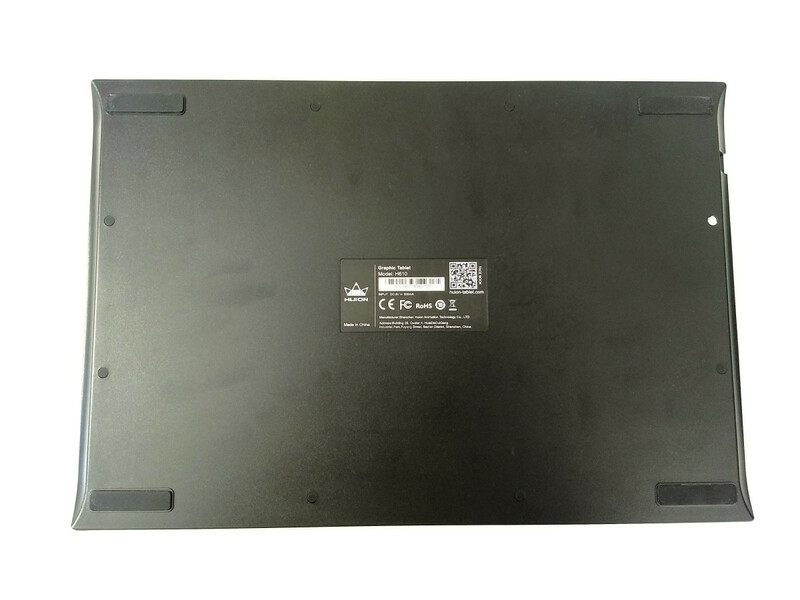 General misconception is that you need to install the driver for the tablet to work. This is not true. The tablet works as a plug-and-play device. But if you wish to customize the buttons on the tablet and stylus, then you need to install the driver. FYI, the name of the software is displayed as PenTabletDriver on your system. OK, so you set up the driver and now what? 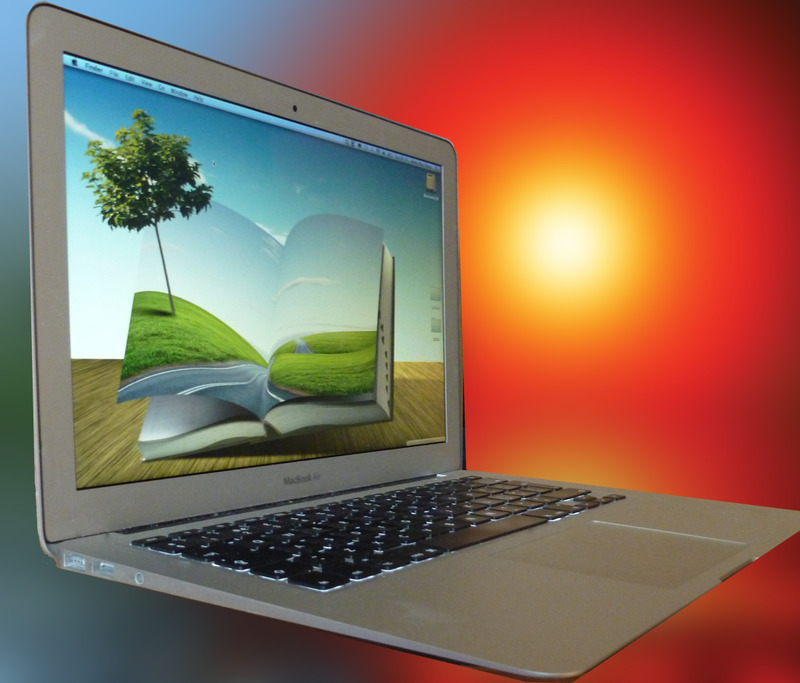 Some functions might require you to open the program with administrator rights. That's why it's better to always run it as an administrator. The interface is very simple and intuitive (see photo below). 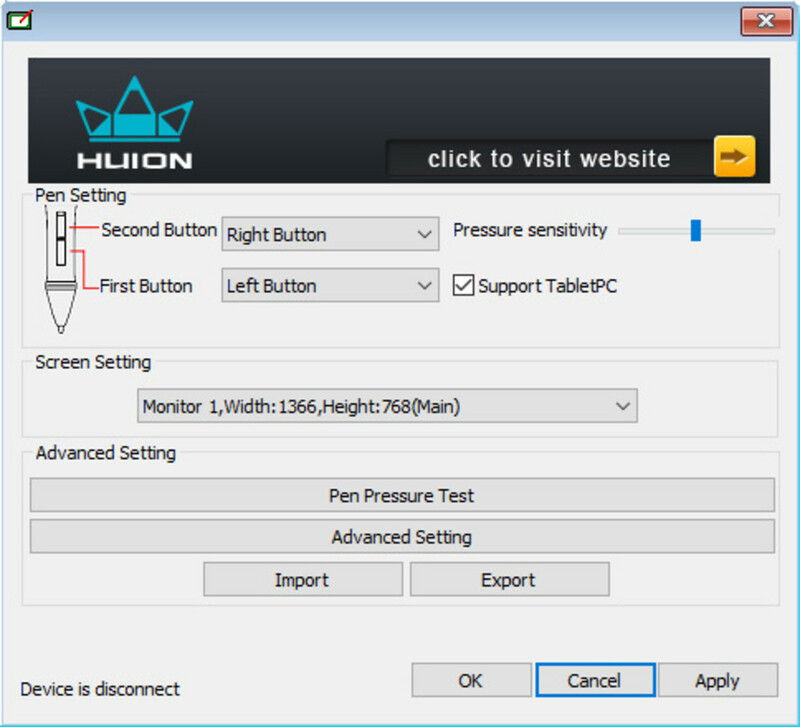 The first thing you'll see are the settings for the stylus buttons along with a pressure sensitivity scale range. There's also a pen pressure test but I never managed to get any use of it. Leave everything else as-is and look for the option Advanced Setting. That's where you'll find the good stuff. This gives your tablet an incredible power! And if you want, you can also disable them entirely. Moving on to the next item on the Advanced Setting screen. The big mesh that you see is your actual working area. That's how much of the surface is detectable by the stylus. Let's suppose you draw using a fraction of the area with smaller strokes, then you can easily define how much exactly you need. Pretty cool! The rest is self-explanatory so I won't get into detail. One thing I'd like to point out though is the Import and Export options. When you finally set up your tablet exactly how you want it, you can export the settings and keep them somewhere safe if anything happens and you need to reinstall the software or use your Huion H610 Pro on another device. Alright! Let's mention a few things about software performance. It isn't perfect. 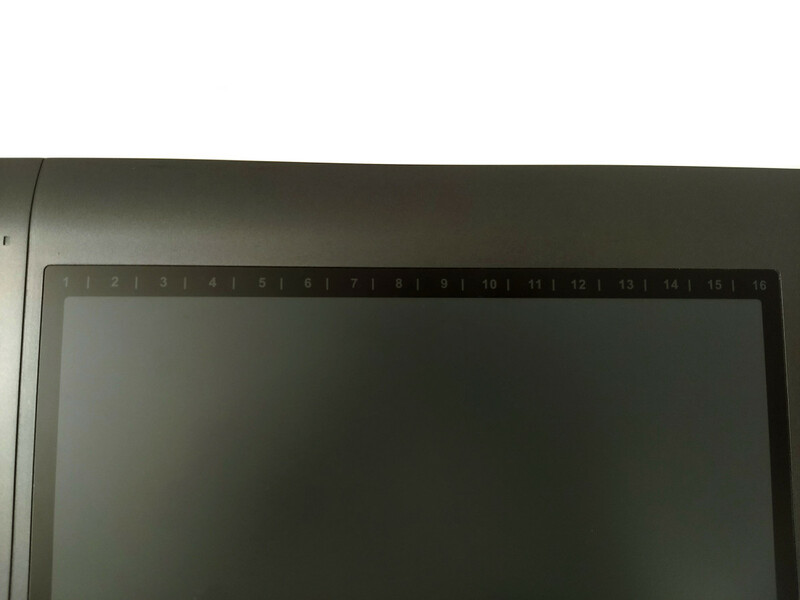 The software won't detect your tablet and activate itself when you plug your H610 Pro. It has to have been already connected when you started your PC. This is annoying because very often it becomes unusable. The fix to this problem is to connect your tablet and then run the program (driver) even if it's already showing as active in your task list. Wait, it gets even more annoying. Suppose your tablet is connected and the driver is running too. Then you need a coffee break and you leave your workstation. Five minutes later you come back and find your device in Sleep Mode. You sign back in and ... your tablet isn't responding. No need to panic! The driver went to sleep too, I guess. You need to restart it. Yep, this is really annoying, I agree with you. But it's just how it is. I reinstalled both the driver and even my OS but nothing changed. Once the program is running though, everything works perfectly... kinda. The stylus works really smooth and well. It feels great on the surface. The 2048 pressure points are clearly doing their job. But one thing I have major issue with is the unstable performance (in my case). Let me tell you what I mean by that. The stylus seems to be lagging too much. It makes my experience totally unacceptable and unpleasant. Another very annoying issue happens when the stylus randomly "leaks" ink and a big spot appears on my line art. This occurs in most drawing software, especially Illustrator and Photoshop which leads me to thinking that it may be a system issue. Currently my 3 year-old laptop has 8GB RAM and I seldomly use any other apps while I'm doodling with my Huion H610, so I wouldn't blame my hardware just yet. At the same time I'm not blaming the software either since I'm not sure it's the source of my problem. It's just something to keep in mind. Apart from those notes, the tablet and its driver work surprisingly well.There's about half a centimeter reading room where your stylus might not be touching the surface but it's still going to register as a click. Huion H610 Pro driver interface. I'd like to close my review by addressing the elephant in the room. The price is the only reason why I considered Huion H610 Pro in the first place. Initially I was going to choose Wacom but Huion's characteristics and price appealed much more to me. In spite of all the negatives I mentioned, Huion really do make amazing products. One of the best companies in the industry for sure! The H610 Pro is right up there battling it out with the giants and making them break a sweat. The truth is that this model has much better characteristics than a model by Wacom within the same price range. Even better, the H610 Pro is perfectly comparable to Wacom Intuos, which is its closest rival in terms of class. However, the Intuous is twice as expensive and it's lacking function keys. You do the math! There you have it, folks. Sorry for the exhausting review! I tried to be as impartial and brutally honest as I could. It wasn't easy to find negatives that were a deal breaker. Huion H610 Pro is truly a remarkable graphic tablet. For half the price of a Wacom Intuos, you get similar characteristics and even better depending on which variation you get. Performance is really smooth overall, not counting some minor issues. 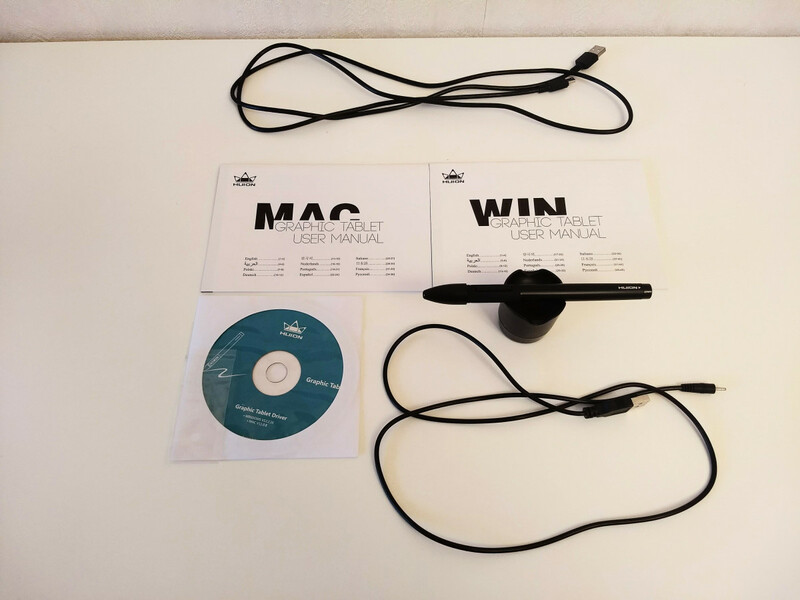 You're given a long USB cord unlike Wacom's products. It's mini-USB, though. That's a format from the past but it gets the job done. You also have a big drawing area with the option to restrict it to smaller boundaries if you prefer to work more compact. And you have access to 24 customizable buttons in total. That's insane! 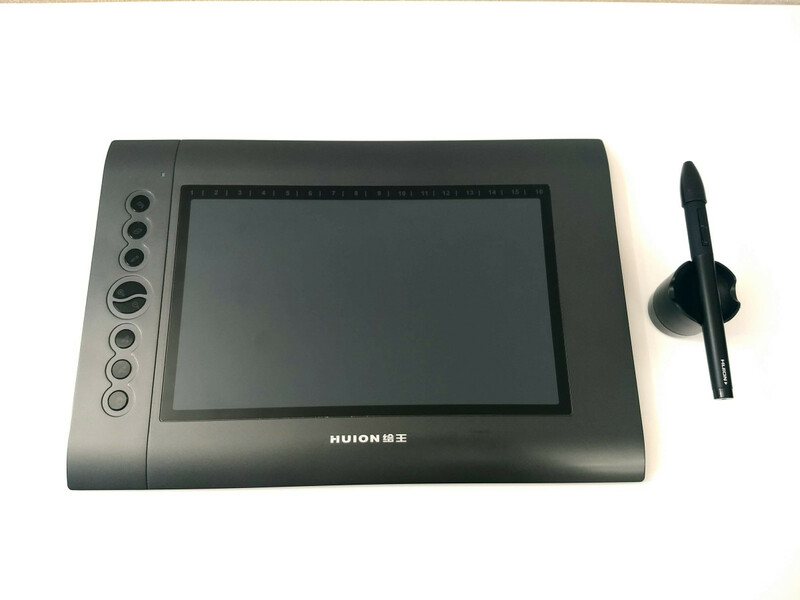 If you're on a budget or someone who is just starting in the Arts field, Huion H610 Pro is exactly what you need! You won't find a better alternative for that price tag. Get the H610 Pro and learn on a tablet closest to Wacom's quality for half the price. What feature would be your main reason to buy Huion H610 Pro?